The draw ceremony will begin at 12:00CET on Friday 21 April. It is being held at UEFA headquarters in Nyon, Switzerland. Who’s in the Champions League semi-final draw? The semi-final first legs will be played on Tuesday 2 and Wednesday 3 May, with the returns the following week. The side drawn first in each tie will play the first leg at home. 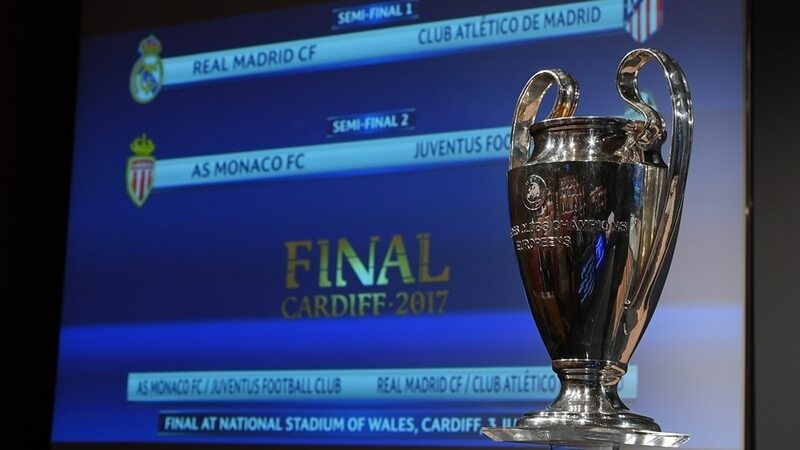 Last season's finalists Real Madrid and Atlético Madrid will face each other in the semi-finals – the fourth season in a row they meet in this competition – with Monaco taking on Juventus in the other tie. There was an additional draw on Friday to define who, for administrative purposes, would be the home team in the final at the National Stadium of Wales in Cardiff on Saturday 3 June. Juventus replicated their first leg performance to shut off Monaco and book a place in UEFA Champions League final. Kylian Mbappes strike for Monaco tonight may not have stopped Juventus reaching the Cardiff final, but it cut short the bids by both the Italian club and keeper Gianluigi Buffon to top the UEFA Champions League all-time rankings for not conceding a goal. Before tonight, Buffon had last been beaten in this competition nine minutes into the 3-1 group stage win at Sevilla on 22 November. Neto then took over for the 2-0 victory against Dinamo Zagreb that capped Juve’s group campaign before Buffon returned for home and away clean sheets against both Porto and Barcelona – and last week shut out Monaco in the 2-0 semi-final first-leg success. Real Madrid survived an early onslaught from city rivals Atletico Madrid to reach the UEFA Champions League final 4-2 on aggregate on Wednesday and set up a mouth-watering clash against Juventus. Real, who won the first leg at home 3-0, have now eliminated Atletico from the competition in four consecutive seasons, including the 2014 and 2016 finals. Zinedine Zidane’s side can become the first team to retain the Champions League title when they face his former club Juventus in the final in Cardiff on June 3. Juventus have been European champions twice; Real Madrid have won the trophy an unprecedented 11 times. While Real Madrid have won 11 of their 14 European Cup finals, Juventus have enjoyed significantly worse fortune, triumphing just twice while losing a record six finals – including the 1998 showpiece to Madrid. UEFA.com looks back on the sides’ past finals.